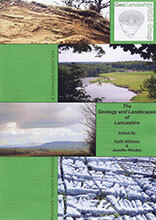 This major new publication aims to demonstrate the links between Lancashire ’s diverse geology and scenery for anyone with an interest in its landscape whether as ‘user’, student or land manager. Firstly, it provides a brief account of the geological history of the county together with sections on the structural and economic geology. Then, nine distinctive landscape units have been identified based on their geology and landforms. Covering the whole of the county, these are mapped and described in some detail with regard to their geology and distinguishing landforms. The landscape units include the major river valleys, the till lowlands, the gritstone moorlands, limestone country and other landscape units which make up the geodiversity of Lancashire. It includes a location map of all county Local Geodiversity Sites in the county with summary information regarding each site; an explanation of how and why LGS are designated; a glossary and guide to further reading. A4, illustrated, 50pp.